ICT is a key enabler in the attainment of Kenya’s Big 4 Agenda. 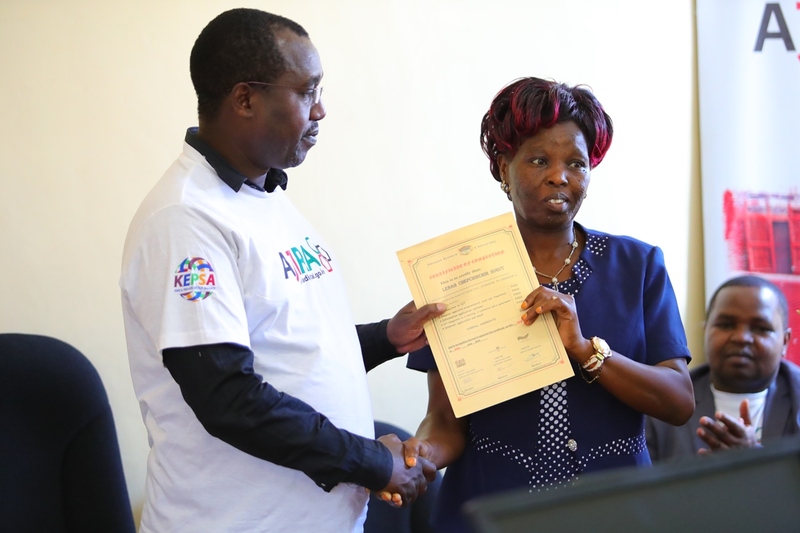 The County Government of Nandi is cognizant of this fact and has since partnered with the National Government through ICT Authority’s Ajira Digital Program to equip the youth with requisite skills they will enable them tap the online opportunities. Ajira Digital Program is designed to instill the youth with digital skills that would enable them grasp job opportunities available in the digital world as an alternative source of income. This will address the high level of unemployment among the youth have basic internet skills since the youth will be given an opportunity to learn the skills that will allow them source for online jobs that will earn them income. They will also have opportunities to do their research, connect with other youth online and pursue online courses that can enhance their skills. In order to achieve this, the Training of Trainers (ToT) by Ajira Digital Program that started on Monday 30th July came to a close today 3rd of August 2018 with 30 graduates ready to get to the field to train other youths all over the county. Among the digital skills for online work acquired during training include content and article writing, digital marketing, virtual assistant, soft skills, bidding, online work security, web research and payment methods. The ToTs also managed to create user accounts in different platforms, like ‘Guru’ and ‘Up work’ accounts, that will enable them get the online jobs. The ToTs are expected to impart the same knowledge to youth across the county so that they can work online and earn a living as a way of curbing unemployment. The County Secretary, Dr. Sang, who presided the closing of the training, pointed out that ICT is an essential tool in service delivery and people should be fast in grabbing and positively using the technology. Also CECM Administration, public service and E-Government Ms. Teresa Morogo; CO ICT and E-government, Mr. Jonathan Misoi and CO public service Ms. Grace Sugut. Mr. Misoi, being one of the online work beneficiary, stated that there are more ICT related training set to take place and will be of much benefit to the citizens especially the youth. Once the training programs are rolled out in the sub counties, the youth are encouraged to attend and acquire the skills as will address joblessness, reducing financial dependency and eventually improve the living standards of citizens of Nandi County. The county government has further partnered with ICT Authority on the National Optic Fibre Backbone Infrastructure (NOFBI) project that will connect sub county headquarters with fiber. This will enhance the penetration of internet connectivity in the county. Moreover, at least one ICT center will be established in all sub counties in the next five years. Two are set to kick off in the 2018/2019 financial year. Computer labs in all the 14 vocational training centers through a MoU with Computer for Schools Kenya (CFSK) shall be equipped and will also act as training centers. More training on various aspects around ICT are lined up in partnership with Jomo Kenyatta University of Agriculture and Technology (JKUAT). These are among many other strategies that have been laid down for a technological revolution in Nandi County.